River Rok pool is Green, not blue! Hello, We studied the SGM mixture possibilities for River Rok and came up with a 10 bag mixture of 7 bags Lucayan Blue and 3 bags of Emerald Black. This was decided because we wanted a very blue, on the darker side color. We do not want this green, lagoonish type color. We spoke with SGM tech support and they reinforced our decision to go between Blue Opal and Baha Sand, which should result in a very blue pool. We watched the mixing process, and everything appeared right, but the pool has come out green, not blue! The water is very clear and it does not appear that the water chemistry is an issue as testing shows normal, new pool numbers, with low alkalinity and low sequestering factor. It appears that algae is not an issue. It has been a week now and the clear water is circulating well. We had SGM out and they have no answer for us yet. The point is that any combination of Lucayan Blue and Emerald Black should result in some type of blue color, not green. Even if we used 100% Emerald Black, it should still be blue. Can any one give us some insight into this problem? Have you had the pool water tested for iron content? That can give a yellow tint to the water that when combined with a blue pool surface results in a clear green appearance to the water. I have also read posts from new pebble tek owners that the true color of the finish takes some time to "show up" after the pool has been filled. We have several pool contractors who visit this site regularly and they may be able to better answer you question. One of them usually pops in during the evening. It is a lovely pool and I hope it gives you many years of enjoyment! The pictures of the pool without water are from the finish before it was acid washed, so it is a little deceiving on what it really looked like when the water went in. However, I do see an awful lot of tan/reddish stones in the mix, and I see them in the Emerald Black on SGM's site also. I also see a lot of "tan" house in the reflection (is this a two story house?). Here's my point (you knew that was coming, right ); water is clear, so you basically get nothing from it. The finish blends in with the sky and the surrounding area, so if you have a blue sky and yellow/tan/reddish stones, you get green tinted water. Take out the lighter colors which blend with blue and make green, and the problem goes away. Take the reflective black and introduce shadows from the tan home and lighter colors come back in play. If you would have used 100% Emerald Black, you would still not have had blue water, as it would "absorb" the sky color and reflect the surroundings, again, introducing the light color of the home and any tall landscape material (trees, hedges, etc.) onto the surface. Imperial White would have given you crisp blue water, and Granite would have given a darker blue coloration. 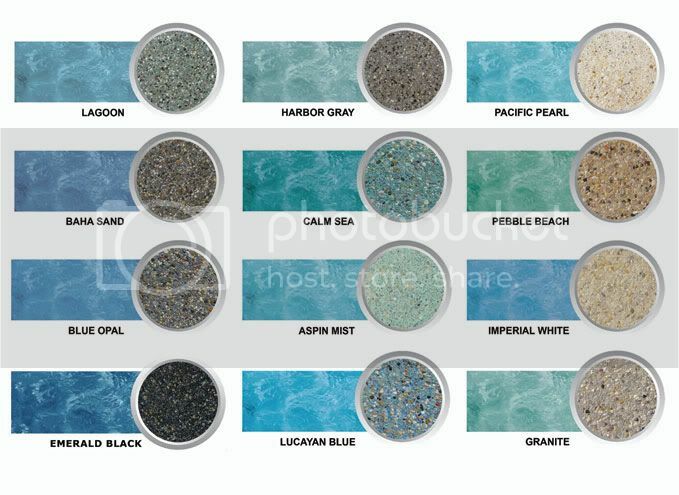 Lucayan Blue would give a blue/green coloration and Pebble Beach would have been an emerald green water color. I know that doesn't change anything, but maybe it clarifies a bit. I'm sorry it does not give you the color you wanted (did you go look at any pools with that finish before you decided? ), but different times of the day and sky conditions may get you closer now and then. Simicrintz, Thanks for your response. My thing is that, if there are "yellow/tan reddish" stones mixing with the blue sky to make green, then I have a problem with SGM, as their mix with that bag count is suppossed to be blue. Their mixing chart shows that and here is the URL to that chart. http://i435.photobucket.com/albums/qq75 ... atches.jpg. It shows the blue colors for Baha Sand (6/4) and Blue Opal (8/2). Mine is in between at 7/3. Thanks. The problem with that color chart is it is all the same picture (looks computer generated), so it is not real accurate. If you look closely you can see the same swirls in all of the pictures, with just a different color on the example. Why didn't they mix Baha Sand and and Blue Opal? I don't see why they brought Lucayan Blue in at all, as it is what brought the green in to play. The gold on the raised spa is also bringing some color to the water. Did they offer to mix, or did you request that? I try real hard to dissuade people from creating their own mix, because it is hard to tell what the end result will look like (it's tough to make a patch, if necessary, later on also this way). They may have been trying to help, but it doesn't look like it ended up being what you were expecting. Bruce, I get so stoked when I read your posts, because you are a builder who gets it! I wish more builders would take an interest in the final water color of a clients pool. Because I think in the end, that's what it really boils down to. This has always been one of my biggest pet peeves with our local pool builders. So my hats off to ya. Thank you for the nice remark, Pontiac. It really isn't me as much as it is how I was taught by my Mom and Dad to treat people and always do your best, and also by the builder that I first started with when I got in to the industry. One of my bosses at the pool company used to say "some people do it to the customer, but we like to do it for the customer". I thought that was pretty good. RE: "Why didn't they mix Baha Sand and and Blue Opal? I don't see why they brought Lucayan Blue in at all, as it is what brought the green in to play." I don't understand this statement, as Baha Sand and Blue Opal are mainly Lucayan Blue with 20-40% Emerald Black? Blue Opal and Baha Sand trend towards blue (at least in the color chart) and Lucayan Blue trends toward a green tint. From the description of what you were looking for in water color, I would not have brought Lucayan Blue in to the mix. It seems like the color you were looking for could have been found in either Blue Opal or Baha Sand, or maybe a combination of those two. I really try to dissuade people from creating their own "custom" color. You cannot see what it will really look like, and you will have a hard time patching it one day, if you need to. Plaster companies go to great lengths and expense to create colors that they can offer, and varying from those colors, to me, is a recipe for disaster. And again, it may not be all of the plaster that is creating the green coloration. I see an awful lot of gold and tan in the surrounding area that is playing off the water as well. It does have some impact, more so at certain times of the day when it reflects more than others. I can't tell, but have you tried putting some of the water in a white 5gal bucket? If the water is still clear/blue in the bucket then there is not much you can do...but if the water is yellow/green tinted you either have metal or algae going on. This is an interesting point I have never taken into consideration. I can definately see how this would come into play. Something's wrong... possible broken lateral... what should I do first?